Mr. Simon Brown, Member of VSOGlobalLeadership and Bangladesh Country Director, and hisentouragecame to visit Beijing Volunteer Service Federation (BVF) on 8thMarch. The delegation was hosted by Mr. Li Lei, BVF Deputy Secretary General and the managers of BVF International Department to discuss the cooperating opportunity of international volunteering project. With the review about historicalcooperationof the two organizations, BVF were grateful for the supports from VSO in volunteering overseas, capacity building for VIOs and international volunteerism exchange. 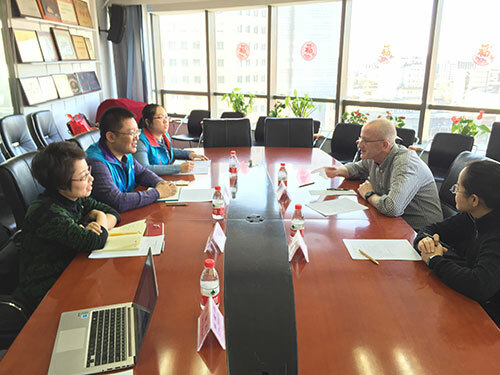 Mr. Brown said the cooperation of BVF and VSO contributed a lot to the Chinese development in international volunteerism, whichbroughtdistinctively fresh energy into the volunteerism worldwide. In recent years, especially motivated by the“Belt and Road Initiative (BRI)”, there is a rapid development both in volunteerism of China and its internationalization. Then Mr. Brown introduced VSO’s international project and pointed out the strengths and opportunities of China in international volunteering from the perspective of the project processapproachof VSO in different countries.The two parties also consulted and exchanged ideas onknowledgesharing in volunteerism and on think tank construction. Voluntary Service Overseas(VSO) reportedbegan in 1958as a mega international volunteer-involving organization (VIO), with mainly focus on agriculture, natural resource,sanitation, industrial engineering, education, social and business development.During 2009-2014, BVF and VSO worked together to support“Spring Shoots Training Programme”for NGOs in Beijing; sent two Chinese volunteers to Nigeria and Kenya in support of localsocioeconomicdevelopment; and co-hosted two Volunteering Expos in 2012 and 2013 respectively.